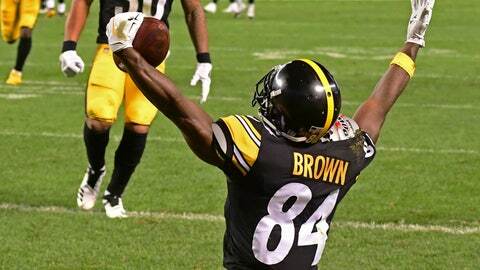 Brown was the near-unanimous choice as the NFL’s top wide receiver by a panel of 10 football writers for The Associated Press. The All-Pro received nine first-place votes in balloting released Friday. Brown was also last year’s top choice. Atlanta’s Julio Jones finished second overall. He received the remaining first-place vote. Jones has 29 receptions for 502 yards, but zero TDs as the Falcons have staggered to a 1-3 start. The Saints’ Michael Thomas, who leads the NFL with 42 receptions through the first four weeks of the regular season, is third. He set an NFL record with 28 catches, the most of any NFL receiver in the first two weeks of a season. “He might catch 150 balls in that offense,” said Philadelphia-based AP Football Writer Rob Maaddi. The Giants’ Odell Beckham Jr., tied for fourth in the league with 31 receptions, but also no TDs through the first four weeks, finished fourth. “Who would have thought a healthy (Julio) Jones and Beckham would have zero touchdowns combined a quarter of the way through the season? Nobody,” said Dallas-based AP Football Writer Schuyler Dixon. Houston’s DeAndre Hopkins was fifth followed by Tampa Bay’s Mike Evans at No. 6. “One of the biggest targets in the game, he’s off to a flying start with Ryan Fitzpatrick this year,” Minnesota-based AP Football Writer Dave Campbell of the Buccaneers‘ 6-foot-5 wideout who has reached 1,000 yards in each of his first four seasons. The Vikings’ Adam Thielen finished seventh. Cincinnati’s A.J. Green, who caught a game-winning TD pass with 7 seconds remaining to beat Atlanta last week, was eighth. “Off to a terrific start while playing hurt, Green has been at his most dangerous in the Bengals’ surprising 3-1 start,” said New York-based AP Football Writer Barry Wilner. Kansas City’s Tyreek Hill, who has helped the Chiefs get off to a 4-0 start, is ninth. “Could have a monster season with the now-ambidextrous Patrick Mahomes,” said Denver-based AP Football Writer Arnie Stapleton of the Kansas City quarterback, who threw a memorable left-handed pass in the fourth quarter of the Chiefs’ 27-23 win over the Broncos on Monday night. And the Rams’ Brandin Cooks, whose team is also off to a perfect start, rounded out the top 10.